I’ve been told that the toes and cuffs taste the best. 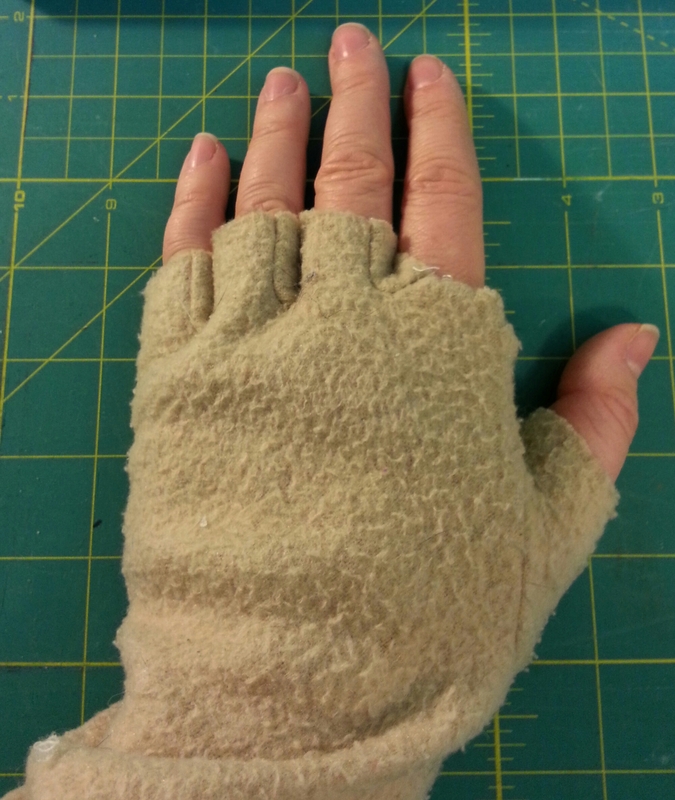 The latter was just begging to be made into a pair of Bob Cratchit gloves, and it wouldn’t even require sewing. I just snipped off the rest of the fingers and that means the edges of the ones that Lilo had chewed up. I did the same with its mate, leaving the fingers longer so I could test out which length I preferred. 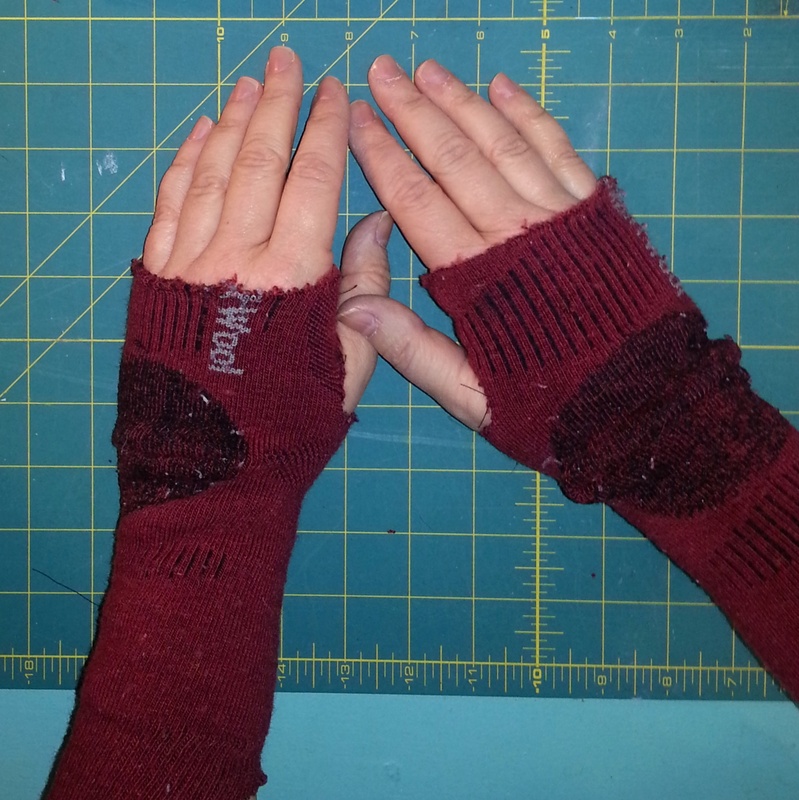 Then I set to work on transforming the socks into wrist warmers. 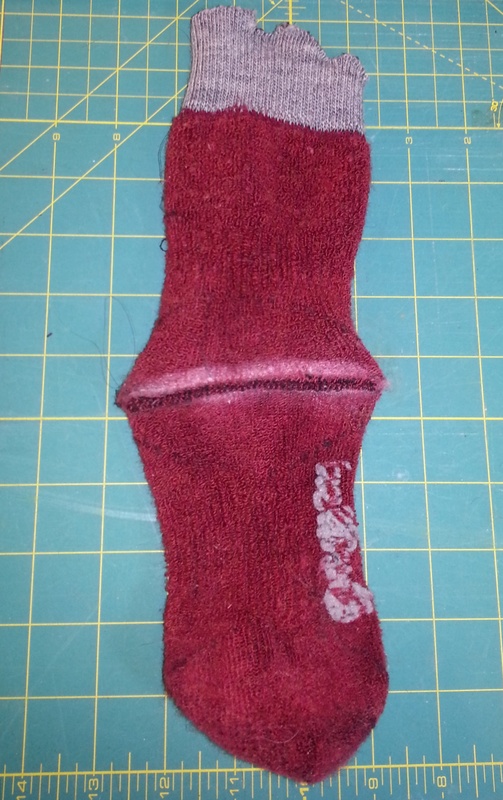 First, I needed to remove the excess fabric at the heel. Working with the inside out, I pressed the top and bottom edges of the reinforced area of the heel together and drew chalk lines around the part I wanted to cut out. I lined the chalk lines up and sewed through them, then cut off the excess fabric. 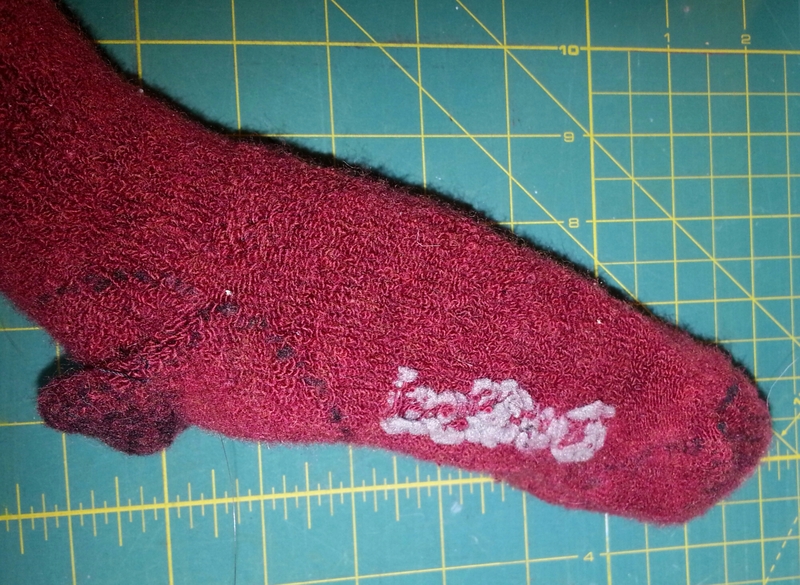 I turned the sock right side out and put it on my hand to determine where I should cut off fabric from the toes. I drew a line around the knuckles, took the sock off, and cut along the line. 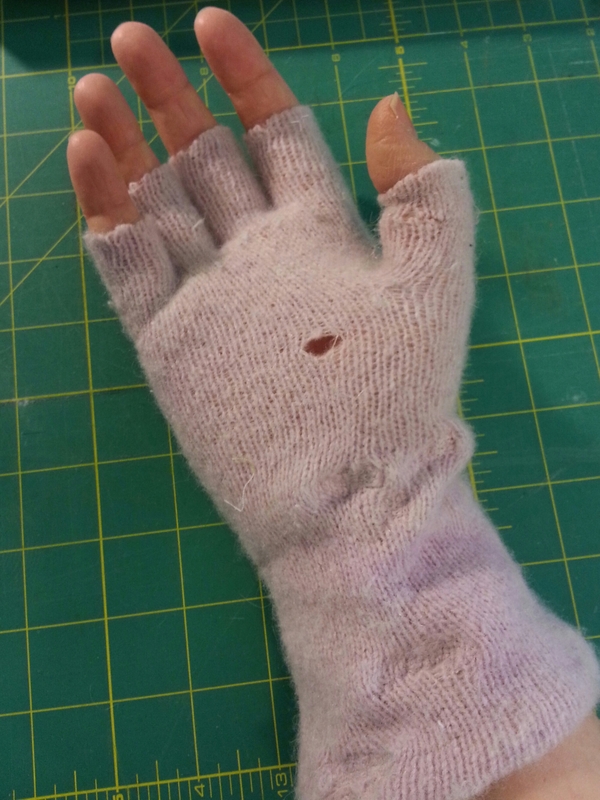 I had not yet made a hole for the thumb, so I put the sock back on my hand, lining the “toe” opening with my knuckles, and drew a chalk line over the joint where the thumb connects with the hand (aka the first phalanx of the pollex, if you want to get fancy). 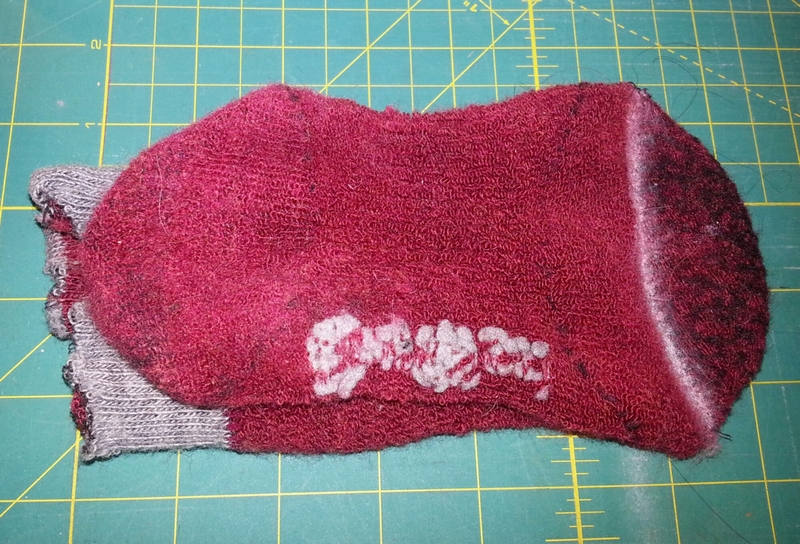 I cut a hole along this chalk line, repeated the steps for the other sock, and donned my new wrist warmers. 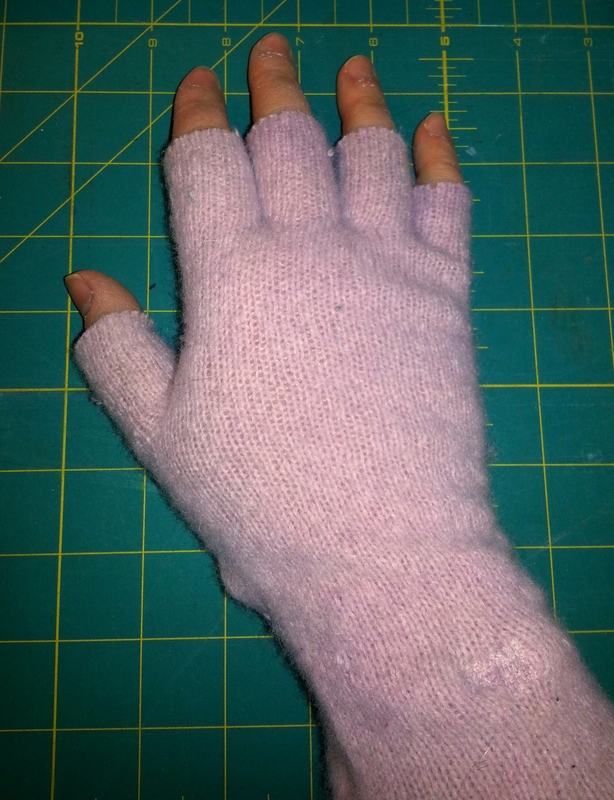 While I was at it, I decided to upcycle some wool gloves that had been attacked by moths. 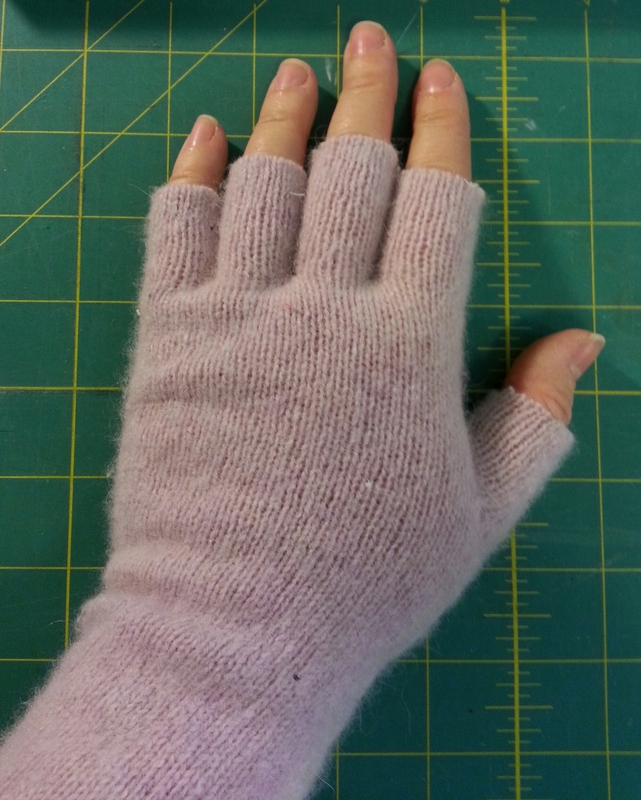 Silly me, I forgot to take a before picture, but basically I cut off the fingertips and used them to machine darn the holes, similar to what I did last week with the cashmere sweater. 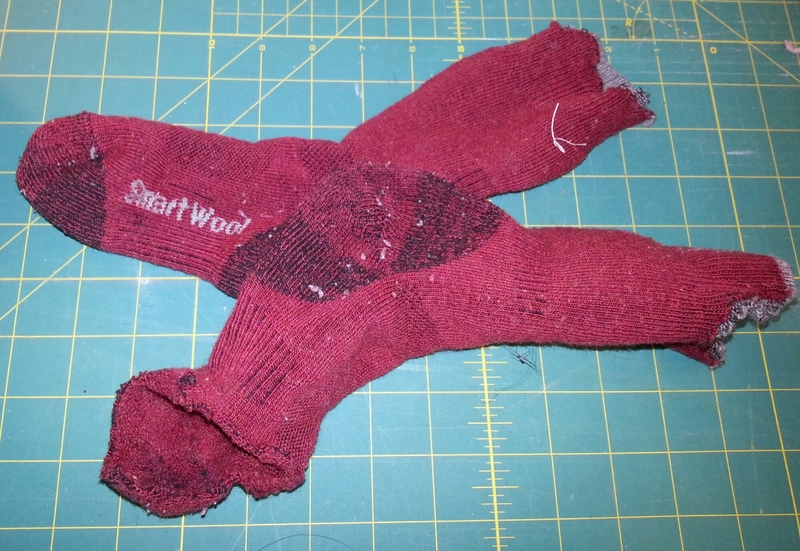 You can tell where I did the darning because I didn’t try to do a very good job and the fabric puckers in each of the 8 or 10 places I did it. 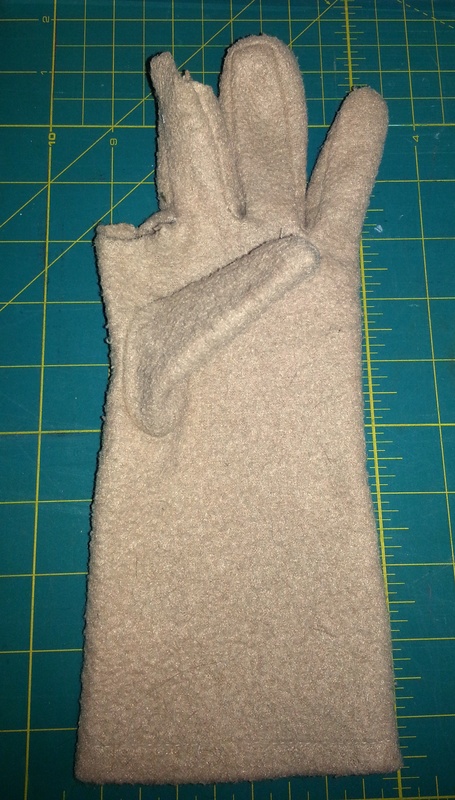 I couldn’t stretch of the palm over the sewing machine, which is why the moth hole there isn’t darned. 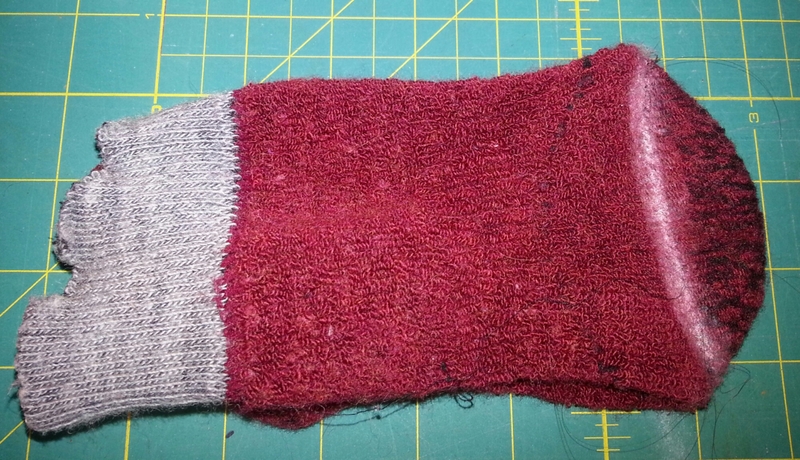 Back view, with a darning pucker visible about an inch below my wrist. So how do they work? I’ve been wearing them for typing ever since I did this, and my hands haven’t gotten that familiar chilly feeling once. 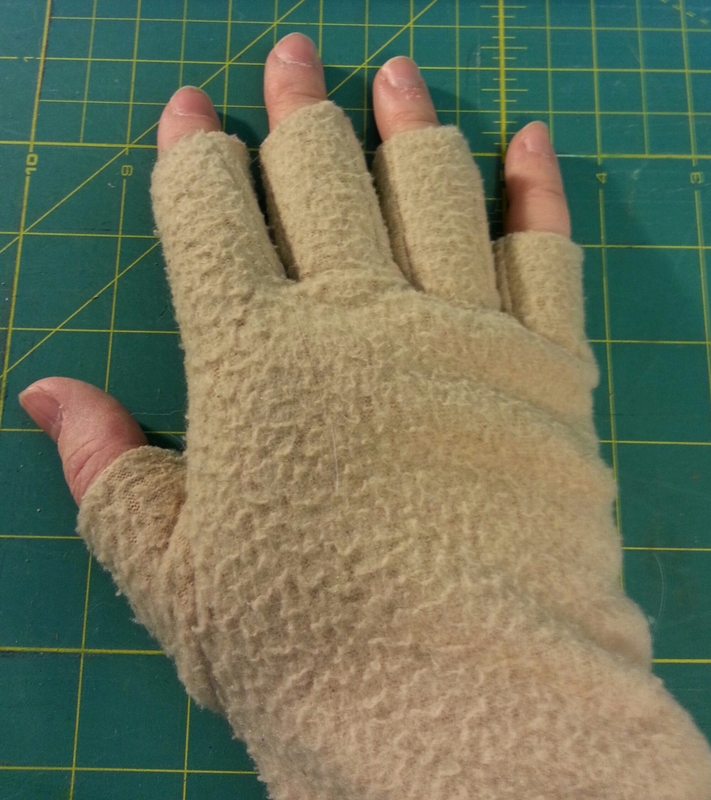 And they all fit under my braces, so I don’t have did make a choice between warmth and wrist support. None of them are particularly attractive, but since no one but Lilo usually sees me in my office, that’s not a problem. Maybe my next project will be making some for public wear (in the meantime, the purple ones will be good enough if the need arises). In sum, I saved up to $40 with very little effort. I should probably thank Lilo for starting this little project for me.